Join us on this fantastic value break in the Brenta Dolomites. Nestled in the cosy village of Folgarida and just 200m away from the ski lift, our resort invites us to explore the vast 150km slopes of Folgarida, Marilleva and Madonna di Campiglio! SNOW is falling... Book now! Experience the variety of Folgarida where we can reach the stylish ski resort of Madonna di Campiglio! Being just 200m away from a lift enables us to travel to a selection of different slopes each day, chasing the best snow conditions, sunshine, empty pistes and endless views. Alternatively, choose a favourite resort and repeat those runs, practising technique and sampling mountain cafés along the way! Folgarida’s reputation springs from varied and extensive alpine skiing rather than lively après-ski nightlife. However, there will be plenty of opportunities to pause for a warming bombardino drink, refreshing beer or a shot of local grappa along the way. Ski together in an area where an abundance of green, blue and red runs offer the chance to progress with confidence from beginner to intermediate. 32 trails representing 53km of marked slopes are linked by 27 quick, modern lifts in Folgarida and Marilleva. Floodlit night-skiing is also an option - great fun, just remember to wrap up warmly! Connecting further to Madonna di Campiglio, we are free to discover what is referred to as Superskirama: a total of 150km of slopes with numerous breathtaking views of the majestic Dolomites. Really good hotel and brilliant Tour Leader. The weather and conditions could not have been better and the group were a pleasure to ski with! Great price for a skiing holiday! Our welcoming, family run hotel is just a stone’s throw from the main ski lift from where you can enjoy 150km of soles in the Folgarida, Marilleva and Madonna di Campiglio region. Look forward to traditional Italian food in the restaurant and enjoy an après-ski in the large bar and lounge area. Room facilities are basic but comfortable in a typical Trento style, all rooms are equipped with hair dryer, television, telephone and safe (extra charges may apply). The transfer from Verona Airport to the hotel is approximately 2 hours, depending on weather and traffic. You may either take group ski lessons, private ski lessons or form groups to enjoy exploring the slopes together. Whatever you preference your Tour Leader will be available to help organise your skiing. Poor piste conditions can be hazardous to ski equipment as uncovered rocks and stones can easily scratch and damage skis and snowboards. We strongly recommend you inspect your ski hire equipment at the start of your holiday and agree the state of their condition with the ski hire suppliers, as clients are responsible for the care of their hired equipment and should this equipment be damaged the ski hire suppliers are within their rights to ask for a compensation payment. This can be hired in the resort where you will be advised about the most suitable equipment for your standard of skiing. It is very important to have ski boots that are comfortable and fit well, so do not be afraid to keep going back and changing your boots until you get a good fit. For your safety, we advise that you wear a ski helmet wherever possible. 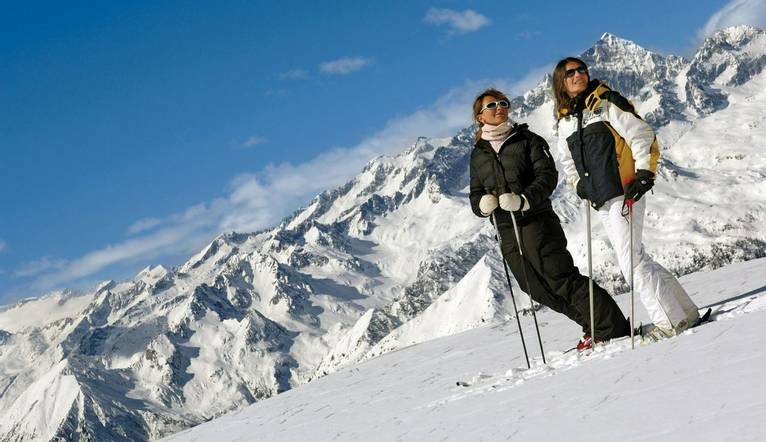 On a skiing holiday, dress is generally very informal, the emphasis being on comfort and warmth. We recommend that you pack a pair of skiing trousers and warm ski jacket or a waterproof shell and separate fleece lining or an all-in-one ski suit. Thermal or silk underwear is recommended. Cotton/cotton mix roll necks, T-shirts or sweat shirts; several thin layers are better than one thick layer. Ski socks, ski gloves or mitts and a hat or headband are suggested. Where temperatures are expected to be well below zero, take a facemask or balaclava. Moon boots or waterproof walking shoes are a “must”. Suntan cream (high protective factor), lip salve, sunglasses and/or goggles are all very useful items to pack. Casual clothes are ideal for the evenings; it is unusual on skiing holidays to dress formally in the evenings. We suggest a Group Collection to cover transfer drivers, and hotel staff of €20.00 per person. Your Tour Leader will collect this on your behalf and distribute it accordingly, thus relieving you of the burden of who, when and how much to tip. The tipping of housekeeping will be left to your individual discretion (a small amount left in your room on departure should cover this and would be much appreciated). As is customary, ‘the hat’ will be passed around for the driver and guide on all optional excursions. For any meals that are not included in your itinerary, or taxi fares, your Tour Leader can advise of an appropriate % to add on. If you choose to have ski lessons, you may also like to thank your ski instructor at the end of the week with a token of appreciation.